CanadaFest is a music festival that celebrates Canadian culture in SouthFlorida. Millions of Canadians visit the Sunshine State and CanadaFest isTHE rendezvous for good times! During the festivities, musical groups of various styles (pop-rock-retro-country, etc.) perform on a large stage from morning till night. A dance floor and a video wall add to the ambiance. CanadaFest is organized since 1982 by LE SOLEIL DE LA FLORIDE and is sponsored in large part by the City of Hollywood, as well as Canadian and American enterprises. 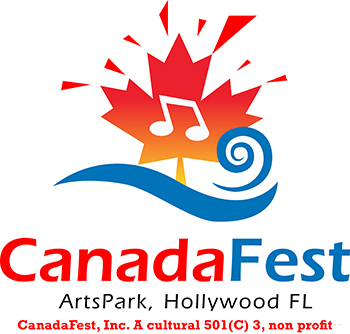 CanadaFest will be held at ArtsPark in the Young Circle, downtown Hollywood (US 1 and Hollywood Blvd). This year, CanadaFest has tons of surprises to brighten your day, from morning to night. It is a rendezvous with good times! Alarge stage, a video wall and a dance floor allow and welcome the diversity of musical program to be presented (pop-rock-retro-country, etc.) to satisfy every festivalgoer! Representatives, collaborators and volunteers are greatly appreciated for their contribution to the organization and implementation of this festive gala that is the 35th anniversary of CanadaFest! Marie-Élaine Thibert, Spokesperson of CanadaFest 2019, is a talented singer known by francophones. Her voice is amazing and she also sings songs in English! The queen of the country, Julie Daraîche, will be present with her daughter Dani to give some exciting shows! Richard Abel will perform with his musicians. Guy Cardinal, Manon Bédard, Lina Boudreau, Karo Laurendeau, Denis Miron and more. Based in Florida, David Morin, one of today’s best Elvis, will be with us; Manon Robert also, pianist with outstanding voice; Jimmy Williamson Through The Looking Glass will impress you with his amazing voice; The young people from Yara’s Academy (Miami) will entertain you as well as Tangi Colombel. The musical program, under the direction of Brigitte Leblanc, will also include this latter, Christian Lemieux and many other artists! Brigitte Leblanc, known as “the storm of the islands” or “the gypsy of the North”, is a singer-songwriter and multi-instrumentalist (piano, guitar, accordion and harmonica). She has produced three albums including Dérive in 1988, Fragile in 1990 and My true nature in 1993. Brigitte Leblanc has been performing for many years with her immense talent as a singer, musician and host on the stages of South Florida, Montréal and the Îles-de-la-Madeleine, her place of origin. CanadaFest gives back to the community! Profits will be given to Shine MSD (Marjory Stoneman Douglas High School where the shootings took place on February 14, 2018) in Florida and Opération Enfant Soleil (Richard Marchand) in Canada. Richard Marchand will be present at the official ceremony on Saturday, February 9that 14:30 followed by Shine MSD, group who will perform their song Shine: https://youtu.be/7-6s8obkaGY. Make your business known! With more than 100,000 visitors each year, CanadaFest offers a golden opportunity to become known in South Florida. Take advantage of this great visibility with Canadians to showcase your products and services. Reserveyour booth now!